Just quickly stopping by with a card I made for Gerda Steiner Monthly Progressive Challenge. I received this cute image six weeks ago and have only just managed to made a card with this cutie! This little smiler is called Watermelon Kid. I decided to keep the card clean and simple mainly because most of my crafting supplies are packed away with our impending move! I had the idea of framing him inside a melon, or at least melon type colours - not sure why! Hope you like him. Thanks for stopping by and hopefully I'll see you in a couple of weeks once we are settled in our new apartment. 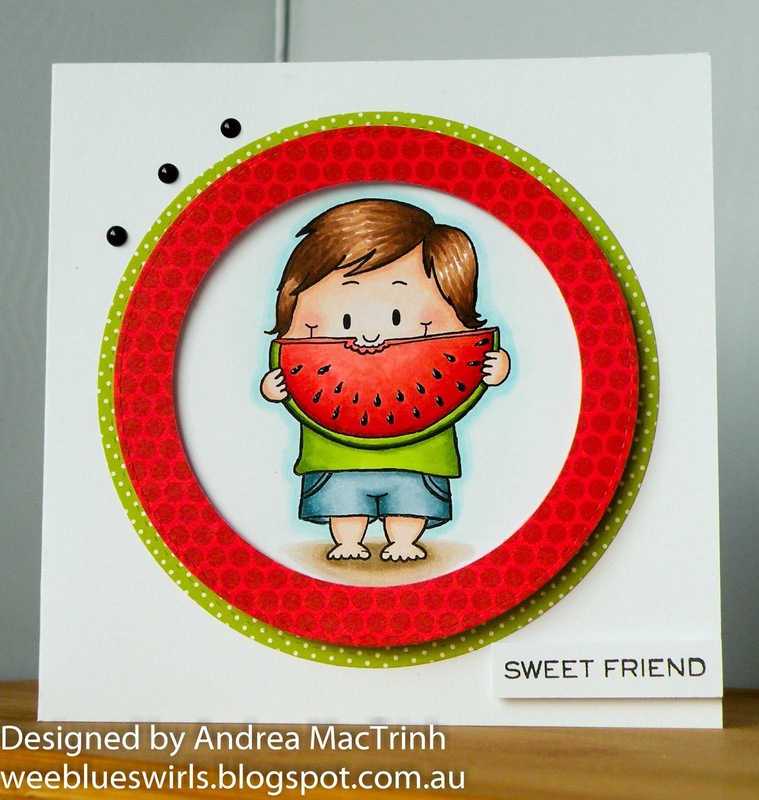 I am in love with this card.... its the cutest ever and that watermelon looks good enough to eat! Thanks for joining us on HOC. Oh my goodness, this is such a cutie!!!! Love his cute little legs and feet and you've coloured him beautifully. And your papers are a perfect match too! Fantastic card and I'm so glad you shared it with us at ATSM this week! This is such a darling card and I love that you surrounded the wonderfully colored image with watermelon colors. Thanks for sharing it with us at ATSM. Fun card! Love the sweet image! Thanks for joining us at House of Cards! I also opted for this sweet little guy - your card is lovely. The CAS look is great and so your colorng !! Gorgeous summer colors and I really adore the stamp you have chosen for your card! Thank you for joining our challenge at Crafty Catz and please come back again. I think this is the CUTEST card in the whole, wide world! Congrats on your HM at Addicted to Stamps...well deserved!! !